Ten months ago a set of buttons were teased. 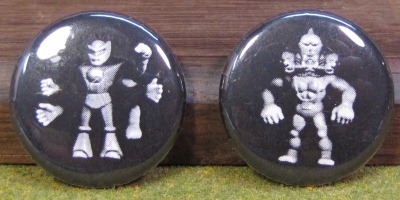 The final piece missing from sharing a full write-up was an interview with Ryan Griffin – the creator of the buttons. Recently Ryan was able to carve out some time and share his history with M.U.S.C.L.E. and how it influenced his art. 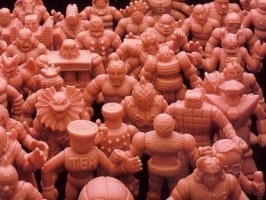 Most collectors remember their initial introduction to M.U.S.C.L.E. figures. And many of those experiences are buying the figures or receiving them as a gift. Ryan’s initial experience was a little different; his cousin was the introduction. Ryan’s cousin was obsessed with M.U.S.C.L.E. figures and constantly on the hunt for figures he didn’t have. Which meant his collection quickly and included hundreds of different figures. But Ryan’s attachment to M.U.S.C.L.E. 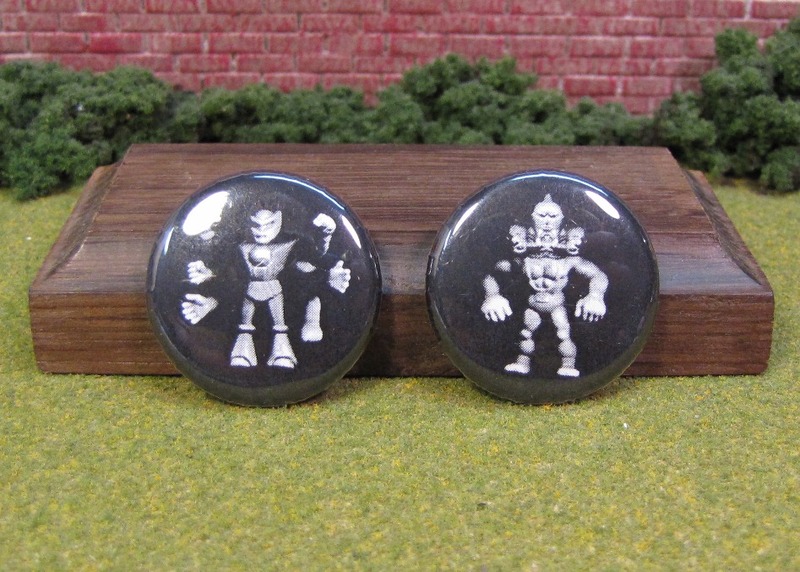 figures came from simply having fun with the figures, and the wrestling ring with his cousin. That inspiration bled into a net-based record label that focused on experimental electronics. Initially Ryan wasn’t sure exactly how the figures would fit into his work. He had collected some figures, but their actual usage was still a bit of a mystery. While he was studying at Cranbrook’s 2D Design Department he was exploring the ideas of products, packaging and themes. Ryan soon found a way to use the figures. He took the collection he had accumulated and created pictures of each figure. He sent the pictures to the other people on the record label and required each person to pick at least two figures. After their choices were made, I mashed the characters up to create hybrids. The hybrids were then put onto the covers of our releases. As the project has went on, I have incorporated other elements as source, but am staying true to the modular nature of the varied characters. The albums and covers were limited to a small size, each release is less than 20 minutes. They were released as 3″ CDs and sold in a vending machine as part of my grad show thesis project at Cranbrook. Today Ryan is working as a concept, graphic, motion, and sound designer for a Seattle based company (but lives in metro Detroit). He continues to make music and noises, posters, and fonts. He is also beginning to assemble a collective media studio with some longtime friends and peers. Some of Ryan’s work can be seen at http://ryangriffin.media and some of his music can be heard at https://soundcloud.com/professor_stone. If you want to download the music (with the M.U.S.C.L.E. cover art), then you can do that at modeofproof.com. Ryan still has his collection of M.U.S.C.L.E. figures. He still tries to add to his collection, but not through message boards or eBay. Ryan and his wife (and occasionally his cocker spaniels) frequent garage sales and junk shops. When he sees them at these various locations he will add them to his collection, but it is becoming harder and harder to find figures as time goes on. So his collection is pretty small – compared to his cousin’s collection. This entry was posted on Wednesday, January 14th, 2015 and is filed under Art, Sociology, UofM News. You can follow any responses to this entry through RSS 2.0. You can skip to the end and leave a response. Pinging is currently not allowed.